and Independent James B. Stockdale (1923–). The debates were marked by moments of comedy, as Quayle and Gore argued over the wording of Gore's book Earth in the Balance. Stockdale admitted that he had turned off his hearing aid. Quayle attacked Gore's record of environmental concerns, claiming Gore was placing endangered species (animals that are in danger of disappearing from the earth) over people's jobs. 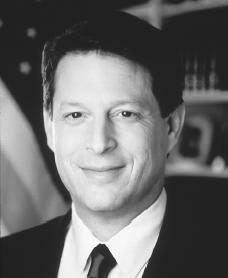 Gore argued that a well-run environmental program would create jobs while preserving nature.